2017 : Signed with the Alouettes on August 16. 2015 : Signed a two-year contract extension with the BC Lions. 2014 : Signed with the BC Lions as a free agent in May. Stephen appeared in six regular season games for the Lions in 2014, recording one reception for 13 yards. His lone catch was also his first as a pro and came against Calgary on September 27th. College: Stephen enjoyed a noteable four-year career at Bishop’s University where he notched 998 receiving yards on 70 receptions over 28 appearances for the Gaiters. His best numbers came in 2013 as the rangy receiver picked up 505 yards on 25 catches with six majors. The Bishop’s alum was a double major in university in business and drama and admits he has always had an easy time entertaining people and still counts dancing and acting as two of his favourite hobbies when he’s not on the field. Stephen enjoys reading in his spare time as well and says his favourite book is The Catcher in the Rye. 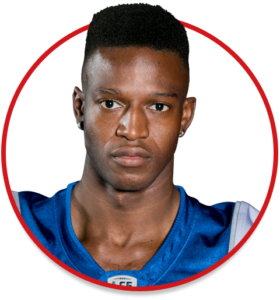 He started playing football at the age of 10, and counts his first CFL game as his most memorable football moment to date.